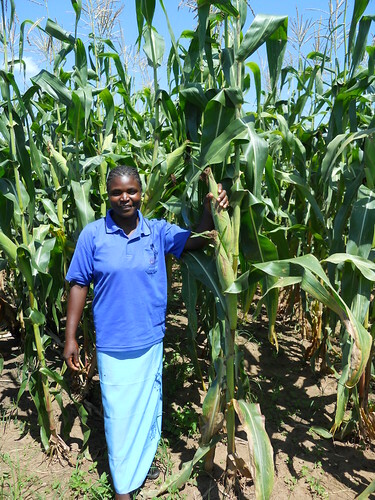 Gertrude Banda proudly shows her maize crop planted under conservation agriculture.Photo credit:Christian Thierfelder/CIMMYT. It is widely accepted that improved maize germplasm will only express its yield potential under optimum agronomic management such as timely planting, optimal plant/space arrangements, efficient fertilization; productive rotation, and timely weed and pest control. Good agriculture practices (GAPs) are the low-hanging fruits for extension of new technologies. They are easily adoptable, give farmers an immediate benefit, and help in the gradual shift from traditional plough or hoe-based systems with maize monocropping to more sustainable and adapted ways of agriculture. It is against this background that the Africa RISING project theme on Sustainable Intensification of low input farming Systems has intensified the out scaling of simple component technologies in a mother-and-baby trial approach in three districts of Eastern Province, namely Sinda, Chipata, and Lundazi. Most smallholder farmers in eastern Zambia are faced with labor and cash constraints. Component technologies that critically address these constraints are therefore likely to be adopted much faster and more efficiently. Based on previous technologies that have been adapted to this environment under Africa RISING, the project has offered farmers to choose from four types of technologies to be tested on their own farm in their own environment. These have been: a) direct seeding with a dibble stick or in riplines; b) improved weed control with herbicides; c) improved rotation; and d) intercropping systems of maize with cowpeas. These have been out-scaled to more than 700 farmers’ fields in 2015/2016 and the project intends to reach more than 5000 farmers in this project phase. The interest of farmers in these component technologies has been remarkable in the 2015/2016 cropping season, as more than 3000 farmers have attended field days and evaluation meetings. Although the trial plots are small, it gives farmers an insight on what the technology can do and how it can be adapted to their own environment.